If you are looking for a way to balance security and BYOD, this guide can help identify the capabilities and features to expect from an enterprise-grade solution. Additionally, this guide proposes the necessary requirements to look for in a solution to best protect your data. A secure BYOD policy can untether the workforce and improve productivity across business units. 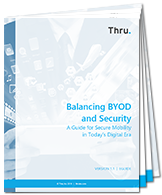 Read the Balancing BYOD and Security eguide.